Waterfall behind kehijaun ferns is the cold is coming from. Wet, soft, white, and translucent. Luckily the water was receding discharge by drought, so that the waterfall can be approached in this close without splashed in the water. Usually at this distance, visitors have to wear an umbrella or raincoat, because splashing waterfalls reaching up to a distance of 500 meters. A breathtaking scenery at an altitude of 700 meters on the slopes. This waterfall Cipendok. 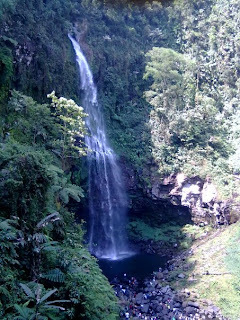 Located about 15 miles west of the city of Noida, Cipendok waterfall located in the village of Karang Tengah, District Cilongok, Banyumas. Smooth entrance to the waterfall area. Left and right along the road, the fertility of agricultural land to extend the foot of the hill. The origin of the name Cipendok waterfall has its own story. When after the Java War, the Dutch colonial government commissioned a district officer named Ajibarang R. Ranusentika work rodi cleared the forest on the slopes. To dispel the boredom and fatigue, he went fishing in a waterfall under which there is a niche or a deep pool. When the hook is directed to the pool, R. Ranusentika felt tip of the hook is pulled by a fish that big, but when the end of the hook is pulled, open it for the big fish are caught on the hook, but pendok or yellow gold dagger sheath that caught the eye of the hook. Since then the waterfall is named after the waterfall Cipendok. Curug Cipendok restored and opened to the public since 1984. According to officials Cipendok waterfall tour manager, the interest of visitors is increasing every year. Data up to October 2007, the number of visitors reached more than 27 thousand people, an increase of 20 percent over the same period last year. Admission price of six thousand dollars, includes accident insurance. For those who have the guts, swim in the pool will not be missed. A group of young men for example. They dared to swim up close to the center of the waterfall. Though pool waterfall or a niche where it falls, has a depth of up to 25 meters with cold temperatures below 20 degrees centigrade. And for young children who want to feel the chill of the waterfall, can throw themselves at a place not too deep as this. The singers are limited in the waterfall Wista this object. They were not allowed entry to the location of the waterfall. They are only allowed at the entrance, and singing in one place. © Copyright 2010-2011 Indonesian Holiday All Rights Reserved.